Rate this Article We've managed to grab ahold of the Ironhide team following the release of their highly-anticipated sequel, Kingdom Rush Vengeance. Check it out! We have had the opportunity to have a sit-down, albeit virtually, with Ironhide Studios, the creative people behind the popular and beloved tower-defense series, Kingdom Rush. We've got some burning questions and thankfully, they have some answers for us! Let's dive right in! 1. If you could only pick one, which feature do you think makes Kingdom Rush Vengeance stand out from all the other Kingdom Rush games? Kingdom Rush Vengeance keeps the classic TD elements players love while adding several improvements based both on players’ feedback and our own ingenuity. For example, players can now choose and combine up to 5 towers out of an arsenal of 16 different new ones! This feature will help each player design their own strategy before each battle allowing more personalization. We also have technical improvements, the game engine we’re now using allows better in-game performance and gives us the possibility to create new mechanics. We’ve been working on leveling up our art techniques even further, always keeping the classic cartoonish style fans love but with a lot more details and animations. 2. Is there a date that players who anticipate getting Kingdom Rush Vengeance on PC/Steam could save? We have plans to release the Kingdom Rush Vengeance on PC as we did with the others titles but we don't have a date yet. 3. Will there be any pre-registration rewards? One or two exclusive hero skins, maybe? 4. 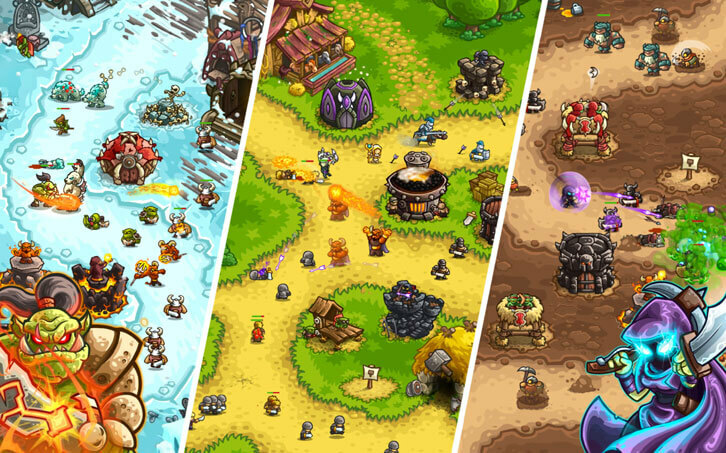 Avid players of Kingdom Rush have been asking for a multiplayer mode for years. Is this something that you’re thinking of implementing into Kingdom Rush Vengeance or future Kingdom Rush games? We would love to have a multiplayer mode or game and we are aware that our fans want it too. It is something we are constantly looking at and evaluating. 5. Are there any plans to introduce new features, game modes, expansions or “DLCs” for Kingdom Rush Vengeance in the future after the game’s release? After we release a game we always update it with more content.​At the moment, the KRV team is working on some final details for the release version of the game, but once this is done they’ll invest their time into future updates and new content. 6. There have been some rumors that Kingdom Rush Vengeance is going to be the final game in the Kingdom Rush series. I don’t believe those rumors but it’s always good to get to the actual truth. So, is that true? To know if Kingdom Rush Vengeance is the last chapter of the saga you’ll have to play and see what is going to happen with the story! 7. Could you give us a sneak peek as to what Ironhide Studios will be working on next once Kingdom Rush Vengeance is launched? We have three different teams working simultaneously at the studio, one for Iron Marines, one for Kingdom Rush Vengeance and another one that’s working on a project we have not announced yet. Vez’nan the all-powerful wizard has returned in Kingdom Rush Vengeance! Embark on an epic journey as you gather up his army to fulfil his devious plans (Muahaha! etc). Show the Kingdom who’s the real boss! Fight your way through and conquer some all-new, unfamiliar realms — as well as some old and rather familiar ones. Pit yourself against empires of mighty enemies and clash with huge bosses in a classic tower defence full of dark towers, dark humour and epic-ness! ● No Wi-Fi at your Dark Tower? No worries, you can play play offline! Are you ready to face your former allies? To overcome the inherent difficulties of new territories and dangers?